An Upland Life wandering photographer stopped by this spring event. Several breeds of pointing dogs were on the scene, and we got a few shots. The bird planting team walks out of the Junior field. The left-hand planter is carrying the bird bag. A Brittany in an early brace works the edge of the junior test bird field. A handler in the junior field has a lot going on. He's using one hand to gesture a steadying command to his German Shorthair, and he's just kicked up a quail (which you can see on a flight path headed right in front of the mounted judge), and you can make out the puff of smoke from the handler's blank pistol (which he's fired to simulate a shot at the bird). Whew! The Brittany Chain Gang (waiting their turns in the field) has a singing Vizsla in their midst. A handler, standing next to her on-point GSP, looks over her shoulder to make sure that the backing bracemate is steady before she moves in to flush a bird. 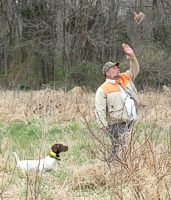 A handler reaches down for a retrieve-to-hand as her shorthair, carrying a quail, passes the gunner that brought it down. Dan, of Braveheart Kennels, sits with Shelby the GSP, Shelby's owner, and a friend (with a Chesapeake Bay Retriever that knows he's not at his sort of event). 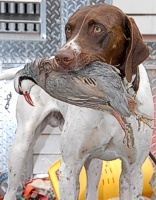 Shelby the GSP with a chukar partridge. Shelby earns a big frequent-customer discount by posing for a shameless truck-logo plug for his pro handler. Lexie the Vizsla, with chukar, poses with Mom. At the breakaway point for the senior/master course, two handlers have a word to make sure they're both ready, and that they know how they'll approach the field with their two young male charges. Shelby on point on the back course. The handler is NOT waving to the crowd. He's just flushed a quail in front of Shelby (who is steady through the flush), and the bird came up right in Dan's face. Dan has actually just swatted at that quail like a mosquito. Shelby the shorthair locked up on another back-course quail. A handler waits for his turn on the junior course. His Brittany is already well aware of what's happening in the bird field. 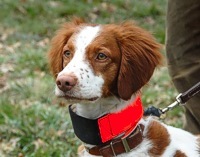 A Brittany's focus is entirely on the bird field as another brace finishes up a junior test. A shorthair on an exuberant retrieve. A pair of handlers on the line for a senior test get some last minute course review tips from the judges that will watch their brace of dogs. A handler kicks the sorghum to flush the bird her Vizsla is pointing. The gunners are hoping for a safe shot, and the pointer's Brittany bracemate - having already honored the Vizsla - is being steadied by the other handler. 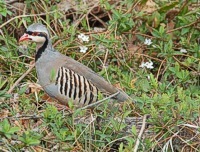 Strolling through the spring shoots and flowers, a chukar partridge is watching for protein-rich insects. A pair of refugee chukars that managed to evade the dogs and guns on the senior/master course have coveyed up in a treeline and are looking for lunch.